Fairy Lake Ontario is a small lake hidden off High Street just past the main shopping area and behind the Bruce County Museum. Fairy Lake was very important to the town of Southampton historically. It has been home to a steam mill, distillery and the tannery which was the main industry in Southampton until it was destroyed in the early 1900s. Fairy Lake was also used for cutting ice blocks. The ice was used in the fishing industry in addition to local iceboxes which were used before refrigerators. Because of this children were warned not to skate on the lake in the winters due to the large holes in the ice. When it was safe bonfires were lit for the kids to skate and play hockey. 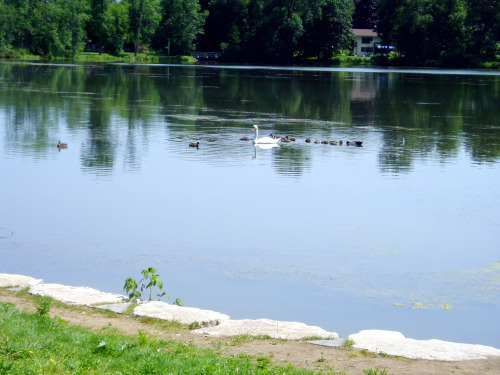 These days Fairy Lake is known for its summer concert series. Classical, jazz, every Sunday evening at 7pm. It is also great activity to visit during the day. 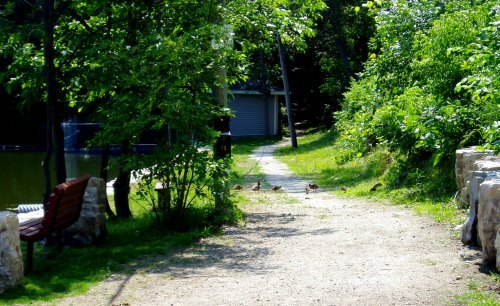 There is a path around the lake which is perfect for a walk. Enjoy the wildlife and trees in this serene setting. On the first Sunday in August the Southampton Art School presents the annual Lantern Festival. Fairy Lake is decorated with lanterns created by children from the Art School. The lighting festival includes a piper led walk around the lake. Fairy Lake is especially breathtaking during this family friendly event. Take an afternoon away from the beach and have a picnic by Southampton's other lake. Take a walk without any bothersome cars and watch the ducks and swans swim on tranquil Fairy Lake. Return HOME from Fairy Lake Ontario.